Hailey Tollesfson earned her Masters of Occupational Therapy from the University of North Dakota. Hailey comes to Pediatric Partners with experience working as a counselor at a summer camp for children with special needs. She specializes in Pediatrics and Mental Health. 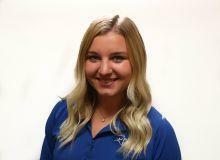 Hailey is licensed in North Dakota and Minnesota and is a member of The National Board for Certification in Occupational Therapy, Inc.